Even the most die-hard fans have to admit that the Star Wars saga features some absolutely insane bits of dialogue. From conversations about how to properly bullseye womp rats, to griping about going into Tosche Station to pick up power converters, A New Hope in particular is rife with hilarious lines for our beloved heroes to utter. However, not everyone is laughing. Carrie Fisher recently admitted that her least favorite line of dialogue in the entire Star Wars saga occurs in A New Hope, when she’s begging Obi-Wan Kenobi for help. I have placed information vital to the survival of the Rebellion into the memory systems of this R2 unit. The actress revealed her immense hatred for the above line of dialogue during a recent Q&A session at the Tribeca Film Festival (via Uproxx). We cannot exactly say that we blame her; the line is a complete mouthful and she probably struggled to nail it during the production of the first Star Wars film. 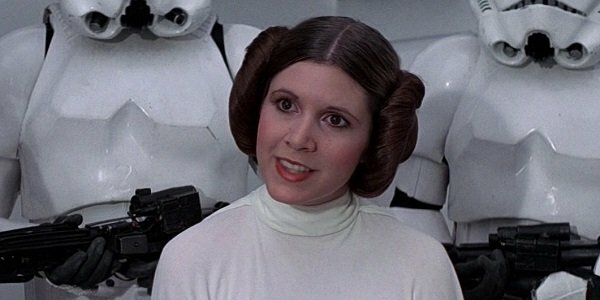 Because she hated the line so passionately, she actually gave the line reading in a British accent, which is part of the reason why Princess Leia goes from sounding like English royalty in he hologram to the rough around the edges American that we all know and love from the rest of the series. She hated saying the line so much that it actually inspired to become a writer herself. We’re going to have to place blame for the existence of the line firmly on the man himself: George Lucas. Although the creator of the Star Wars universe deserves a ton of credit for the amount of technical innovation he pioneered over the years, his ability to properly craft a script leaves much to be desired. This is why we found ourselves endlessly glad that screenwriter Lawrence Kasdan returned to the saga for the script of last year’s The Force Awakens. Of course that line should seem familiar to just about anybody with event the most passing knowledge of the Star Wars saga. Princess Leia utters the words in her holographic message to Obi-Wan Kenobi during the early portion of A New Hope. Check out the scene below, because I know you’re feeling nostalgic. Although Carrie Fisher maintains a fiery hatred for the above line, we’re still glad she sucked it up and went managed to pull it off all the way back in 1977. It’s a small detail, but it’s one of many that add up to create the utterly immersive galaxy of Star Wars. We will have to wait and see how the writing of the saga continues to improve when Rogue One: A Star Wars Story hits theaters later this year on December 16.